In response to Mayor Emanuel's concerted efforts to improve the bicycling infrastructure of Chicago roads, other cities in Illinois have visibly demonstrated their desire to follow suit: Champaign, Springfield, Hoffman Estates, and Des Plaines are just a few. However, in the affluent suburb of Winnetka, plans to install bike lanes spanning across the village have been stalled by concerns voiced from the village council. Spearheaded by the Village Park District, the Winnetka bikeway plan hopes to install numerous bike lanes through residential neighborhoods to connect parks, schools, and trails in the North Shore suburb. Most notably, a safer connection from the Green Bay Trail to the forest preserve was cited as a priority of the park district director. Other items on the Winnetka agenda include a joint project with the Illinois Department of Transportation installing a shared bike lane on the state-owned Sheridan Road. Illinois Bicycle Lawyer Mike Keating lives in neighboring Evanston and is a regular bicyclist and runner on the Green Bay trail through Winnetka. He is fully aware of some of the problem areas cited in the Tribune article that pose potentially hazardous situations for cyclists on Willow and Tower Road. 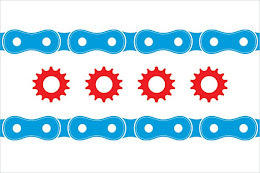 He and the rest of the Illinois Bicycle Lawyers at Keating Law Offices fully support the park district's goals to make cycling more accessible for area residents. Bike lanes like the ones discussed in Winnetka, have been proven to dramatically reduce the risk for bicycle accidents and crashes due to the division between bicyclists and motorists. Bike lanes, even just painted ones, not only provide a "bright line" between where motor vehicles should be and bicycles should be, the lanes also serve as a "warning" to motorists that bicyclists may be present. This phenomena is why bike lanes are part of what planners call "traffic calming" measures. .